The PirateBox has come a long way since it’s inception in 2011 by David Darts. After reading about it’s existence I first got to interact with one at the Elevate Festival in Austria. I remember downloading a book by Cory Doctorow and uploading an Mp3 from a band I used to be in. It felt liberating to have this private shared space. An internet only those in the room had access to. Back then, this self-contained mobile communication and file sharing device was about the size of a lunchbox and housed a portable router/web server, a power source and some form of memory. They came in all shapes and sizes but the key component was the ‘FLOSS’ (Free, Libre and Open Source software). Although the hardware has evolved over the years, it’s function remains the same. Like a collaborative digitized Pirate radio. Your own private internet. Within range of it’s open wireless, those connected can share digital content and chat anonymously. Audio, video, images and documents are shared via a simple browser page. The next time I got to play with one was recently at a StationX meet up at The National Museum of Computing at Bletchley Park. 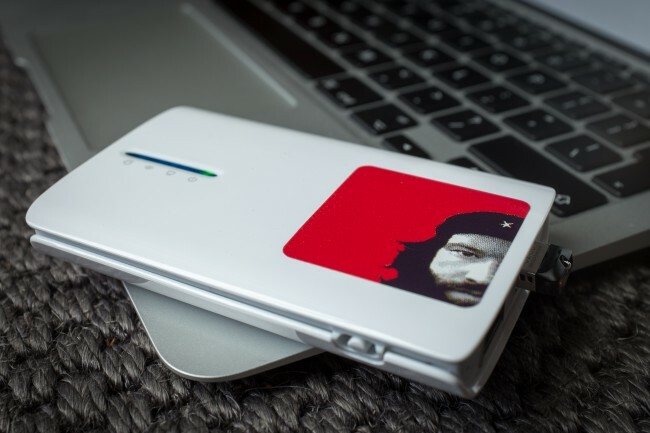 I’d been chatting with @MatStace prior to the meet up, wondering if a MiFi could be hacked to do a similar job as the pirate box. Mat brought his little TP-Link TL-MR3020 and after a quick Google I found that the latest version, the TP-Link TL-MR3040 had a built in battery. This was exactly what I was looking for. I immediately forked out the £40 and as soon as it arrived I set about flashing the firmware with the PirateBox set up. It took me about 5 minutes to ‘brick it’ (i.e break it). The steps were simple to follow, but I’d not used the latest version of the of the firmware (V2). Luckily Mat knows this kind of tech inside out and after a late night of tinkering he got it sorted and posted it back to me. It works perfectly. It’s a super compact solution and the 2000mAh internal battery lasts a good 4 hours with heavy use. I’m looking forward to attaching a solar powered battery in an experiment to see if it will run outdoors continually. If you are uncertain about setting up the device yourself, feel free to visit the StationX meet up at @TNMOC where you will surely find a friendly geek to assist. This is my new favourite toy. I’ll initially be using it in my workshops and talks. The perfect portable hub for sharing thoughts, ideas and digital media. A pocket internet, a place to collaborate and discuss. What’s the point in a shared culture if you can’t freely share? This does all that and more. If you already have your own PirateBox, please leave a comment and tell me how you use it. I’d also like to know if you have a different set up or have modified the software. If you are yet to have a play with one, have a sniff around at the next festival, hackday, geek meet or conference. 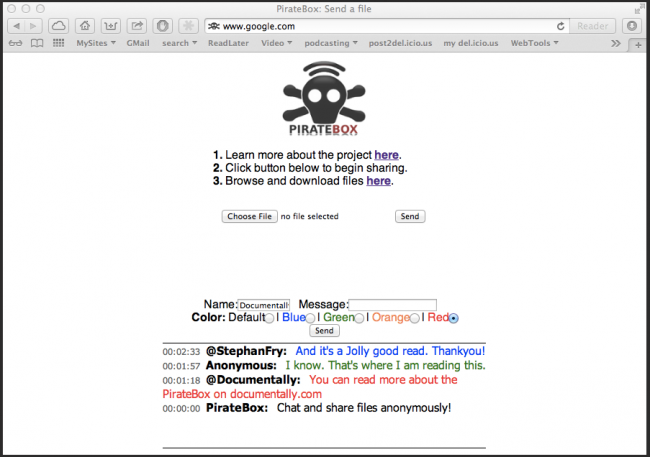 You may well find a wireless hotspot called ‘PirateBox – Share Freely‘. If you see one that says ‘DocuShare – Share freely‘ That’s mine. A friend tweeted this article to me. I have 2 Pirateboxes set up. One is here at home, on my Ubuntu box. It just uses the wireless card and only gets out a few dozen feet. It was primarily just a test to see if I could get it to work. But it also now serves as an example of a captive portal that I have been wanting to do with my other hobby, retro Bulletin Board Systems. I still run one and had the idea of being able to have a BBS that act as a hotspot for others to connect to. Connect to the hotspot, fire up telnet or ssh, and connect to the glorious days of the BBS. My second one is a Raspberry Pi model B, using and Edimax micro Wifi dongle. I have it sitting in my old iPhone4s box, with a hole strategically cut out for the USB cable to power it. I have taken it a couple places and plugged it in and let it sit for a bit, but no one has ever uploaded to it. But people have mentioned seeing it pop up on their mobile devices. I’m planning on getting a TP-Link to flash and building one that is more independent, maybe with solar so it can be deployed more easily. A goal I think I would like to achieve is to build several Pirateboxes, and setup the ability for them to sync up with each other when in close enough proximity. Then redeploy them. I would really like it for people to share anything they create themselves. This is one of the more interesting projects out there, and I feel it says something about all the control the big media companies are trying to push on the average consumer. If they want to push us away, then we’ll move away and find our our networks. Thanks for the epic and informative comment. Sounds like you have been experimenting for a while. I have a few portable solar panels but one I have by ‘PowerFilm’ has a small power reservoir that I think will keep a PirateBox running 24/7 if needed. So many possibilities. I’m really hoping someone hacks a Mifi, as with the internal micro sd card it would truly make a compact unit. I have a spare Mifi if someone wants to play. You should contact Matthias from the PB forums. He wrote most of the scripts to get it to work. I’m betting he could get it to go. Or at least give it a good try! It looks like a chunky thumb drive, but it uses a microSDHC stick (16 or 32 GB, and is supposed to handle a 64 GB microSDXC) for its memory. The appealing part is that it’s got its own battery and WiFi router built right in, although you do have to use the special app (on an iOS or Android device) to configure it. People with the app (and, if you’ve secured the drive, the network password) can upload and download content, but cannot rename or delete anything. People without the app can use a browser to download, but have no way to upload…that I’ve found. The battery’s rated for four hours of streaming, and it recharges through the USB connector. It’s got some rough edges, but at $60 (32 GB) for a WiFi LAN that I can wear on a lanyard, I ain’t complaining too hard. If anything, I’m more annoyed with my e-readers’ inability to join its (or any) LAN; if they can’t ping the internet, they flat-out won’t join the network. The only thing I really dislike is that although the drive can join an existing WiFi network, that capability doesn’t work at public hotspots…because, lacking a browser itself, it can’t deal with the login page. Even so, that’s not a problem with the device as much as it is with that method of pseudo-securing hotspots. Hi, Thanks for the comment. Fascinating stuff and interesting looking device. I wonder if it can be modified to be more open. Thanks for sharing. 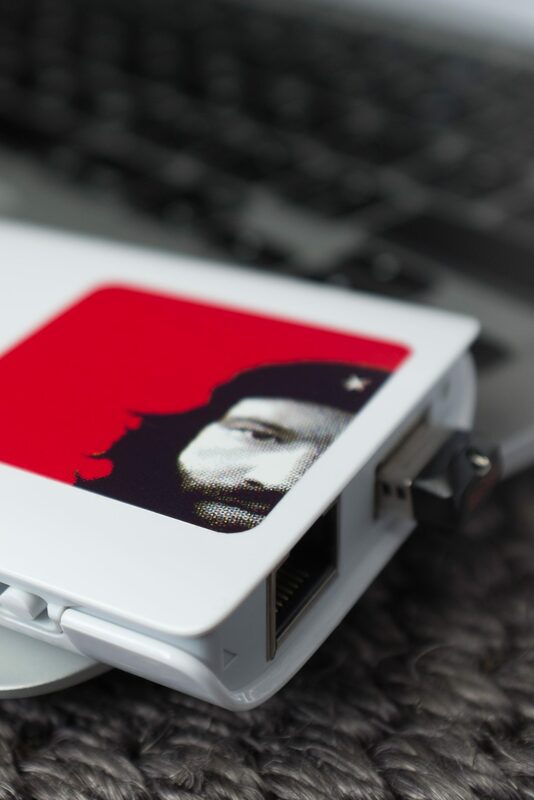 Possibly related to this, this would be an amazing device for PirateBox if it can be made to work: http://haxit.blogspot.ch/2013/08/hacking-transcend-wifi-sd-cards.html – it’s an SD card with a built-in WiFi access point running a small Linux system. Making it run stand-alone off a battery would involve a bit more tinkering, and then you’d have to port the relevant software to it, but it should be possible in theory. And once that’s working, I imagine it shouldn’t be too hard to combine with a solar panel. Been following your blog for some time, great stuff! Cool. Good luck. Let me know how it goes. Curious about the specific model you went with, or does it not matter since you’re just sharing internal storage and don’t need upstream internets? the link you’ve provided to Amazon seems to autoselect the “cable” model rather than a 3G version, for example. There is an Ethernet socket.. Is that what you mean? I have Ver 2.2. Cool! Having a lot of fun with it here in Australia. Sharing images between devices without using international data is one use. Hello, I am very excited about pirate box’s capability. My million dollar question is if I can broadcast a wamp server on the little guy without an internet connection and use the wamp localhost as a captive portal. Or am i just getting greedy? Re solar power. Solar Joos makes great small portable panel that is easily carried in a shoulder bag. I have beat the crap out of mine and handles tablets on down ( i have not tried it for laptop). Goal Zero makes a set up for more power demand, but not as portable ( laptop, mini fridge (beer! ), ham radio, etc.). The other option is to build your own to get exactly what you need. Roll up panel might be an option (ex. Brunton, Flexgen). Spectacular article by the way! Can a captive portal be used on the MR3040? I want it so that when people connect to the WIFI network from the MR3040 that they are presented with a browser pop up immediately after successful connection to the WIFI. This browser pop up takes them to the index or home page. Possible?